Snack food bouquets are a little more unique and unexpected, when compared with homemade gift baskets. Don't get me wrong, gift baskets are a classic lovely homemade gift (find my homemade gift basket instructions here). ...but the next time you want to give someone a gift of their favorite snack foods, such as jerky, seeds, nuts and fruit bars... consider putting the basket back on the shelf and try making a fun edible arrangement instead. Food gift bouquets are easy to make... they allow you to create a thoughtful homemade food gift without ever firing up your stove or oven. In fact, you don't have to make any food at all. Like candy bouquets, food bouquets are a mash up between flower bouquets and gift baskets (without the baskets and the flowers). They are beautiful and impressive looking arrangements... plus they are FUN TO EAT! If you know someone who loves to snack but prefers less sugary alternatives to candy, a snack food bouquet may just be the answer. Make your own yummy food gift arrangements with local jerky, small packages of nuts and seeds, energy or health bars, dried fruit bars... maybe a few small sweets... or no sweets at all. Here's a few perfect occasions for giving a homemade food bouquet. Get Well Gifts: A snack food bouquet can be brought to someone in the hospital to brighten up their day and give them a few things to munch on other than hospital food... or to someone who is bedridden or is just not feeling that great. It would also be easy to throw in a little word search book, a Sudoku book or a deck of playing cards. 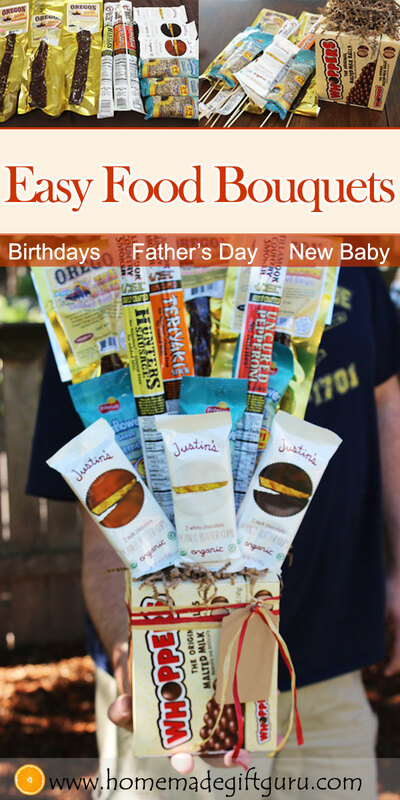 New Baby/New Parent Gifts: A snack food bouquet can be given to new parents to help them through sleepless nights and new parent challenges. Graduation Gifts: Graduation means growing up and moving on. What better time to share a beautiful bundle of snack foods. 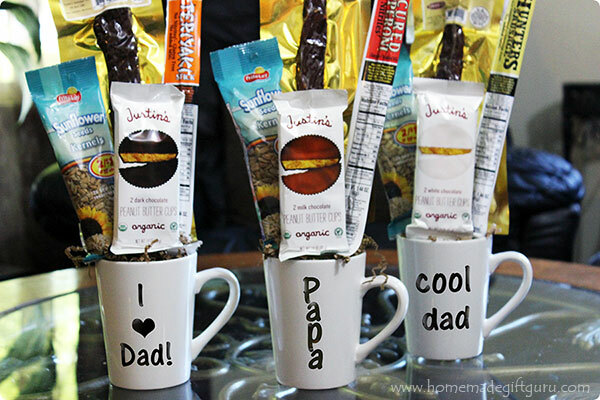 Food gifts make thoughtful homemade gifts for graduates who may be going to college, looking for a job, or simply off for the summer. 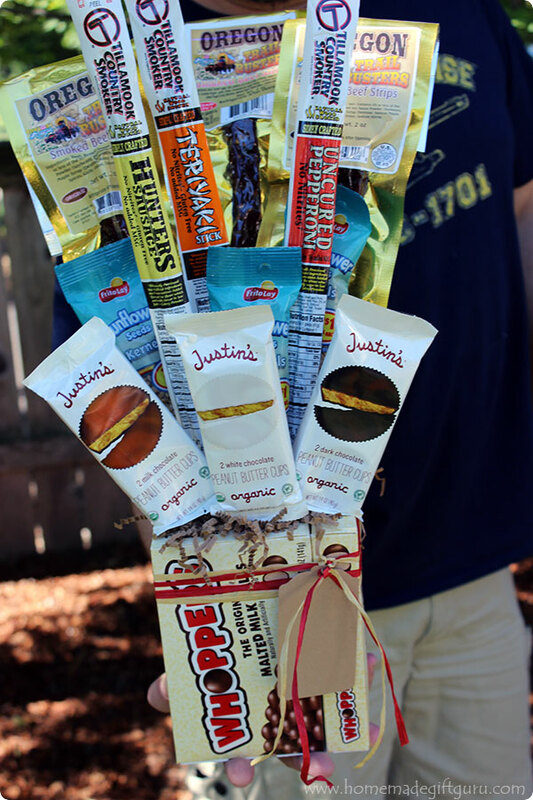 Birthday Gifts: Snack bouquets make great homemade birthday gifts for anyone who loves jerky, nuts, seeds, energy bars, fruit leathers etc. A snack bouquet is just like a homemade gift basket full of snacks, but prettier and more creative! Work Gifts: Food gift arrangements make great homemade gifts for employees, co-workers or even work-related prize drawings. Everyone appreciates food and these can be made with local foods and healthy foods. Alright, ready? Here's how to make a snack food bouquet. 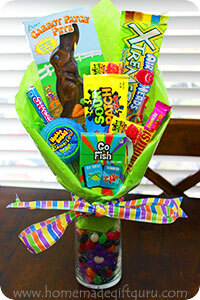 There are many containers you can give a candy or food bouquet in, but the one I chose below is edible... how cool is that!? 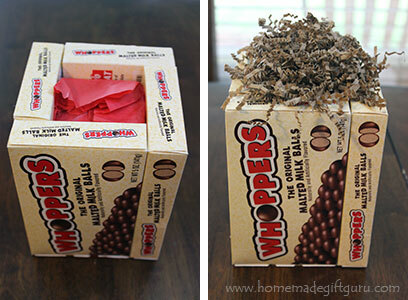 Four boxes of whoppers worked like a charm and gave this bouquet a bit of crunchy sweetness for a well rounded snacking assortment. Jerky. Beef jerky, local jerky, other favorite types of jerky. Nuts and Seeds. Small packages of sweet or savory nuts and seeds (it's hard to see but the bouquet shown has three packages of sunflower seeds, which worked great to inexpensively bulk up the gift and made my gift recipient quite happy). Dried Fruit. Fruit leathers and fruit bars work great. Power bars. Health bars, energy bars and power bars are all good options if your gift recipient needs some healthy snack foods for energy. Favorite "Snacky" Chocolate. A bit of dark chocolate or chocolate with nuts can be added to give a satisfying bit of sweetness to your snack bouquet. I chose 3 different kinds of organic peanut butter cups for this one plus the boxed malt balls (which all happen to be my gift recipients favorites). Healthy food bouquets make great homemade gifts for special diets... These food gift bouquets can be made for most diets. For example, use gluten free, sugar free or even paleo approved snacks... or simply choose the healthiest options for healthy homemade gifts. Whatever the situation, your gift recipient will be delighted that you made something special for their dietary needs. It shows tremendous thoughtfulness. Feel free to take your snack bouquet in any direction you like. 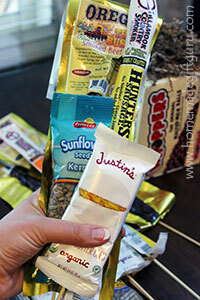 Get more ideas for containers here on the DIY candy bouquets page and change up the snack foods however you like. Trim Floral Foam if Needed. To make a box candy "vase" put 4 boxes of candy together and determine whether or not you will need to trim your floral foam. For this project, my floral foam rectangle was the perfect size. 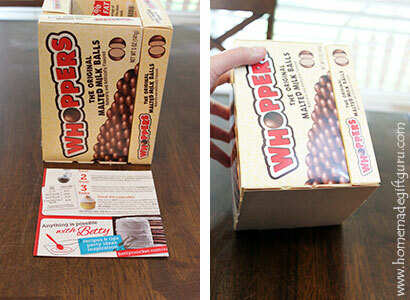 If it's a little big, trim it with a flat edged knife so that it fits within the 4 boxes of candy. Hot Glue Boxed Candy Together. 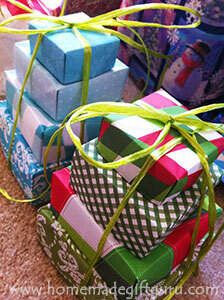 Glue each box edge to the next, forming a square or rectangle shaped container. Make Bottom for Vase. 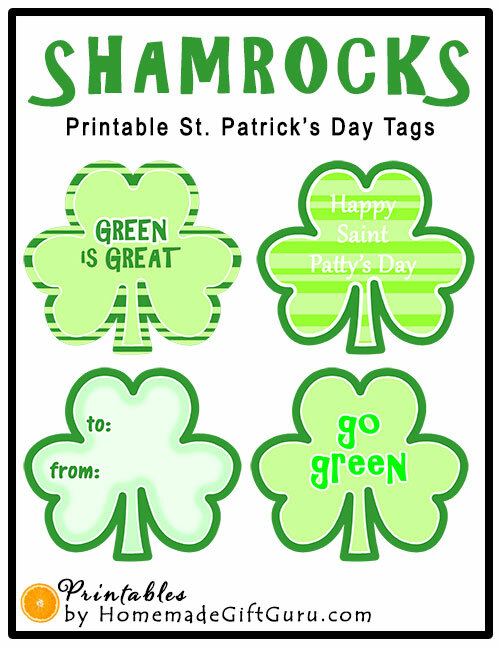 Trim a piece of card stock or paper board (like that from cereal boxes) to the exact size of your vase. Glue. Hot glue it to the bottom, forming a bottom for the vase. Tip... Be sure the best looking sides of the boxes are facing outside and up before you glue them together. Wrap and Insert Floral Foam. Wrap a piece of tissue paper around the floral foam so it looks nice. Put a little hot glue on the bottom of the wrapped floral foam and insert it into place. Optional Paper Shred. If desired, put a big handful of paper shred on top of the floral foam. Prepare Wooden Skewers. 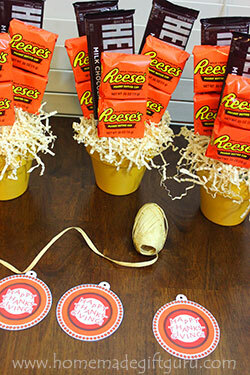 Hold up each packaged food item to the vase and determine how tall each stick should be. Trim sticks if needed. Attach Packaged Food to Skewers. 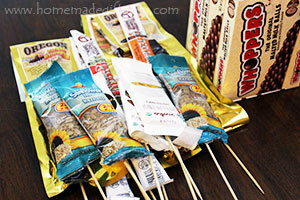 Using clear packing tape, tape a wooden skewer to the back of each food item. Fun Tips... To make a snack food bouquet that's more themed or festive, you can wrap some or all of the foods in gift wrap paper or scrap book paper. You can use letter stickers to spell words. You can even put a special non-food item on one of the sticks, such as playing cards, a small stuffed animal or a homemade sign. Arrange Snacks on Sticks. Time for the creative part! To make your snack food arrangement, stick each snack on a stick into the floral foam, creating a look you like. Tips for Making Arrangements... working in groups of threes is an easy way to start. Put the tallest items in the back and move your way forward. ...If you want, you can wrap ribbon around the bouquet and attach a gift tag or you can attach a gift tag or message onto it's own skewer and add it to the arrangement. I hope you enjoyed this homemade gift idea and it inspires you to make a similar creation! 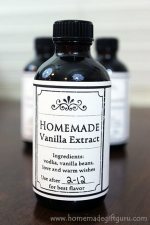 If you'd like to inspire others to make homemade gifts, consider sharing your next homemade gift in the HMGG photo gallery!